Malaga weather station is 16m above sea level and the temperatures given are likely to apply to the whole of the Costa del Sol. 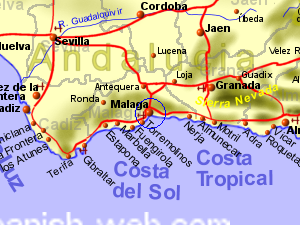 However the Costa del Sol is characterised by having a backdrop of mountains, rising to as much as 2000m, only 20 or 30Km from the coast. In these mountains, temperatures will be significantly lower, particularly when the sun is not shining. This area should expect a little more rain than the Costa Tropical and Costa de Almeria to the east. Further north from Malaga, beyond Antiquera and the lakes, the climate will start to be influenced by the Guadalquivir basin where some of the highest summertime temperatures are recorded.